Hello! I’m Jes from Mommy Envy. 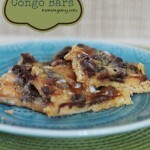 Today I am sharing with you these amazing Super Caramel Congo Bars! I was first introduced to these in college (back when I worried less about what I ate). The recipe is super easy to make and everyone enjoys them! 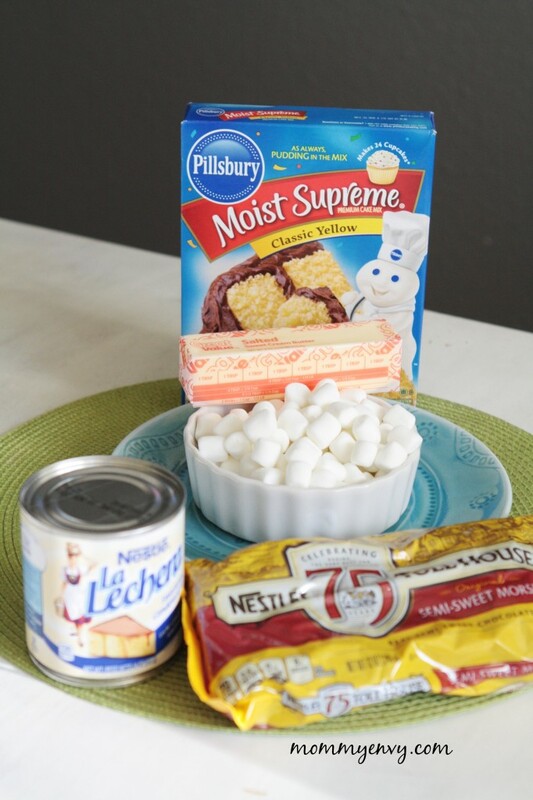 I love bar desserts and I think Kristen is a genius when it comes to bar dessert recipes! 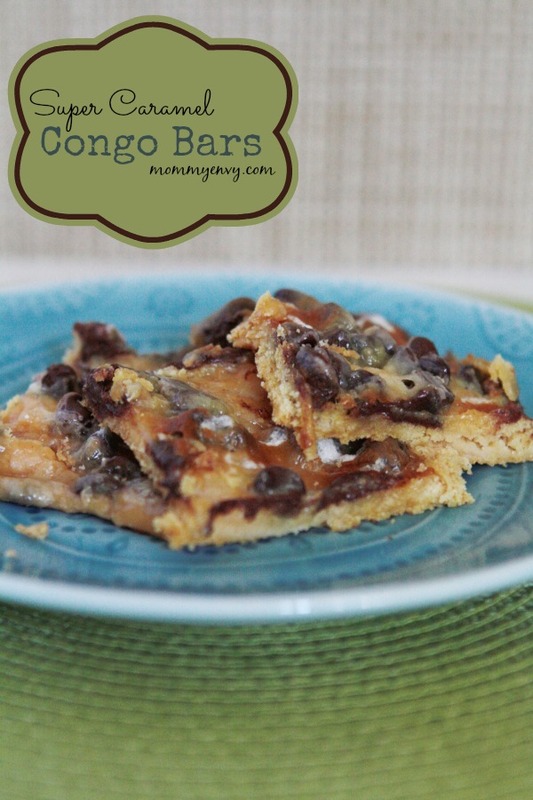 You can make these in a jelly roll pan (to make thin bars) or 9×13 (if you want thicker bars). Either way I highly suggest using wax paper. Wax paper will help get the bars out of the pan so you don’t end up with a pile of ooey gooey caramel. If caramel does get on your pan let it soak and it will come out easily. Now do you have one of these nifty tools in your kitchen? You really should. I use it all the time to open a can of chicken broth really quickly. It has a magnet so it can just stick to my fridge for easy access (no digging in my kitchen gadget drawer). 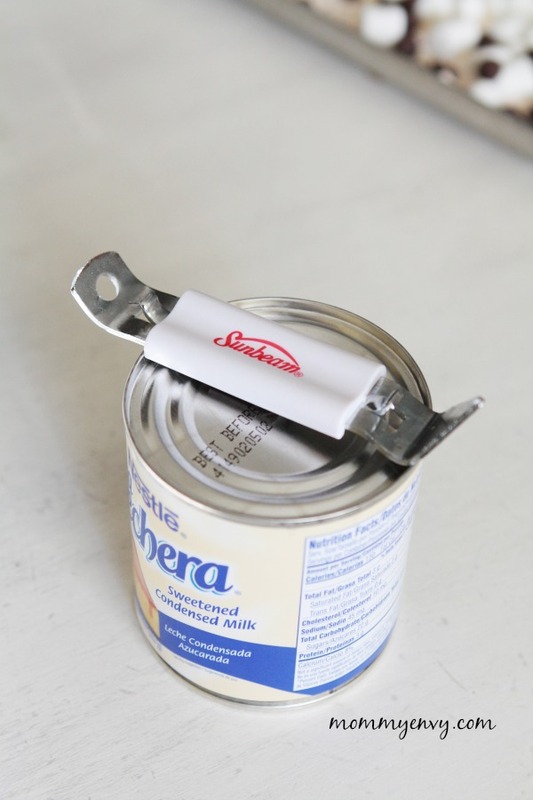 I made two holes in the sweetened condensed milk to help pour better. The great thing about this recipe is you don’t have to measure out the ingredients every time you make it. Once you make it once you will get the idea and can eye ball the ingredients. This is great for people like me who don’t follow recipes very well. No matter the ratio it still turns out yummy! The ingredients are super simple! 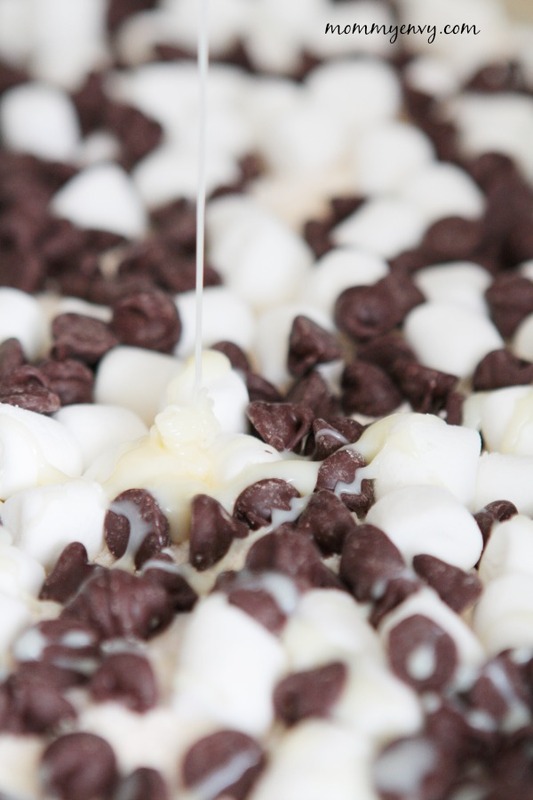 1 yellow cake mix, 1 stick of butter, marshmallows, sweetened condensed milk, and chocolate chips. Did you know sweetened condensed milk turns into caramel? I always forget that. You can add a tall glass of milk to the recipe to help wash it down! Here’s the recipe but like I said it will always turn out so use this as a guideline. If you use a 9×13 you will probably use less toppings. And don’t forget the wax paper! Sprinkle cake mix over the butter.